For the short break between Christmas and New Year’s, we took a quick trip down to Mexico. We decided that because of its proximity and wealth of cool historical sites and legendary food, Mexico would be perfect for quick jaunts mandated by short work holidays. 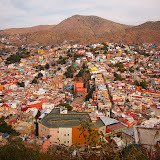 On this, our first such trip, Taylor and I tackled (well, barely scratched the surface of) Guanajuato and Mexico City. We had a great time checking out the sites, including lots of churches, mummies, some haunted houses (very popular for some reason), museums, and Aztec temples. We of course also had a lot of fun with the the food culture, though sometimes it was a challenge to find good vegetarian options. In Guanajuato, however, Enchiladas Mineras, which are typically vegetarian, are a local specialty dish. Also, if you were ever doubting it, we learned that enchiladas are definitely an “anytime food” – breakfast, lunch, dinner, snack, or whenever! We’d like to give a shout-out to Carmen, the proprietor of Hogar de Carmelita Hostel. Aside from being a friendly, gracious host, Carmelita and her staff were also fantastic cooks, preparing delicious vegetarian breakfasts for us each morning. Here are our versions of our favorite Mexican breakfast dishes: Molletes, Enchiladas, and Chilaquiles. And who can forget the classic tradition of making that slightly off-tasting Mexican beer taste by adding some lime and hot sauce – micheladas! We, uh, “sampled” them several times a day while there, and were impressed by the variety of preparations. Basically, as long as you have lime and beer, you have a chelada, or add some hot sauce and you have michelada. Our michelada recipe is based off of one we had before we went for very fun boat ride in Xochimilco, but don’t be afraid to be creative when you make your own! I’m glad you had a great time. I’m loving and feeling very nostalgic seeing all your photos.